While it is not entirely necessary to read book - we learn of the events as Riley does - it does help things fall into place sooner and lets you know the character history a lot more. All the main players from book one reappear. I have to say my favorite thing about this book is Riley - and I think that's what the author intended. 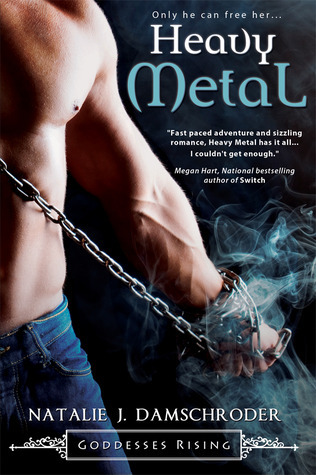 Riley's ability to pull energy off metal is unique, both in the book and in my reading experience. I love new ideas presented well. While this is a very powerful ability, it has some major drawbacks - such as what do you do when in a forest with no metal? Riley also is one of the more dynamic characters I've read. She begins as a frightened and suspicious woman on the run from things she doesn't understand. With lots of help along the way, help she is hesitant to accept at first, she turns into one of the most amazing characters ever. The story is not only about Riley's journey and discovery of herself, and Sam of course, but also the next step in the Society's development. The Society is the agency put in place to try and help Goddesses. In book one they suffer a major set back that they are still trying to recover from several years later. Heavy Metal resolves a few unanswered questions and opens a whole hallway of doors that need to be explored - many of which are throughout the book. The romance was present, but not center stage. I almost didn't label it as one, but it does seem the best description after all. It's hard to imagine trying to start a relationship with everything that is going on in Riley and Sam's lives, but there is something brewing between them the whole story. With both being very strong and independent types, there are a few very interesting scenes and conversations. The end was perfect for me. Almost everything important was wrapped up, but there was just enough of the big picture stuff still hanging out there to really drive you to read the next book in the series, although I have no idea who they will pick as the main characters - even more intriguing. This is a series I am beginning to love and I'm so glad it found me.